The City of Salatiga, situated in the mountains of Central Java, is recognized by the Indonesian government as a “water catchment” area for the surrounding districts. Despite this, Salatiga is in a perturbing condition. •Water levels at natural springs have dramatically reduced; some have dried up all together. •Areas necessary for water catchments have become factories or housing estates. •Rubbish and pollution are at alarming levels. •Deforestation occurs without consideration of the effects to water and the environment. 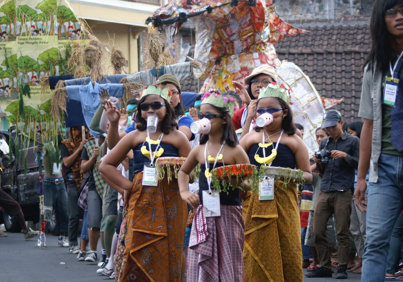 Tanam Untuk Kehidupan (TUK) is an environmentally concerned artist community in Salatiga, Central Java. 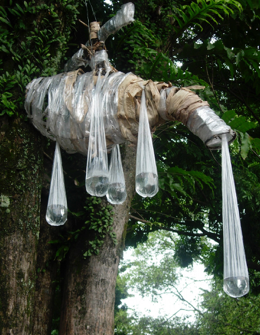 Founded in early 2006 TUK actively campaigns the issues of water conservation and the environment to the wider community via the use of ART and cultural practice. TUK’s programs include children’s workshops, mural painting, exhibitions, environmental forums, reforestation, Clean Up events, sustainable festival and event management and environmental film screenings. TUK also run an annual environmental art festival called Festival Mata Air (Festival of Water). Festival Mata Air has become an international platform for collaboration and exchange between a wide range of art communities, musicians, environmentalists and local residents. With a strong emphasis on grass roots community organising, capacity building and skill sharing, this festival has established itself as a significant community-based environmental awareness campaign. TUK’s Recycled Trash Program removes items out of the waste stream and transforms them into innovative products using environmentally sustainable production techniques. 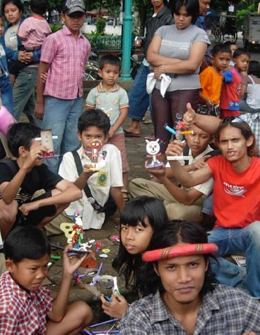 Komunitas TUK is a legally registered Community Based Organisation (Lembaga Komunitas). Komunitas TUK is located in Salatiga, a small city at the foot of Mount Merbabu in Central Java. Salatiga is approximately two hours drive from Yogyakarta Airport, one hour from Solo and about 45 minutes from Semarang. If you are interested in getting involved in TUK or would like to participate in our programs, please feel free to drop by or contact us. TUK’s Vision: To help protect a sustainable environment for future generations. TUK’s Mission: To plant sustainable environmental awareness and education in the community through art and cultural practice.